Genuinely I have been trying to find the words to describe how Michael Allred’s art fits into the world of comic art. You find these artists that transcend all recognised types, who have based their style on none that have come before. This is obviously limited by my own knowledge, but I would be fascinated to hear who Michael’s inspirations are. There is an endearing and honest quality to his art with a touch of humour, that makes it thoroughly enjoyable to read. This cover touches all of those bases and shows Hulk being smashed by the Surfer’s cosmic board. The sprawled out green giant flying towards our eyes is hilarious, especially considering he is upside down and in distress. It is rare to see Hulk so brutalised but it does draw attention to the reason why he has been attacked. As you look between his legs you will see Norrin, post strike protecting Dawn, a normal human. I do adore the big action “Thoom!” bubble by the way. However Dawn is drawn tentatively as she peers from behind surfer, looking a little apprehensive and concerned. The roles of our classical heroes are cast in doubt as we wonder why Norrin would be protecting someone from Bruce, who exactly is good and bad here. If you peer into the background, you can see crop circle constellations of some kind of planetary significance, and also Stephen Strange in the top right corner. This brings magic and the dark arts into the fray and then leads to all kinds of mystic manipulations that only build intrigue to the book. Note must be made of Laura’s colouring as she brings a light and colourful palette to the art that helps to build the tones described above. 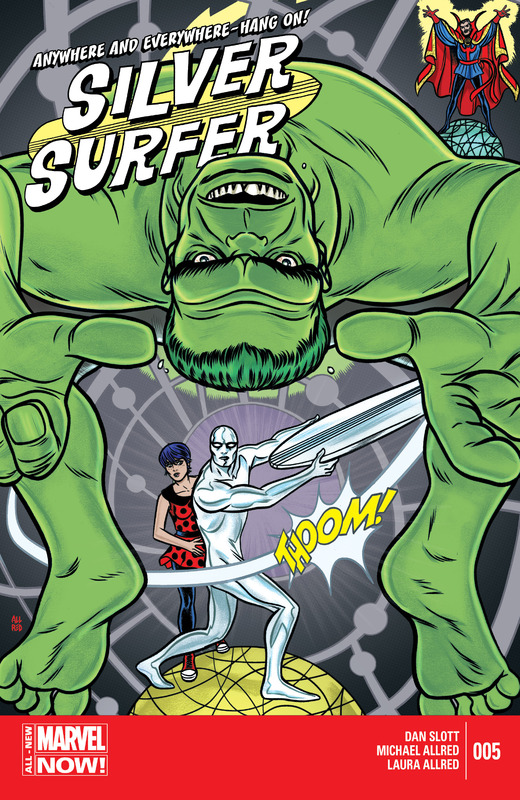 This cover serves its purpose in drawing people to read the comic, because its rare to see Hulk so vulnerable in a moment of slapstick humour as we ponder the intentions of the Silver Surfer. Job done spectacularly well. Next PostThe Theatre List 27/8 – The Who’s Who!